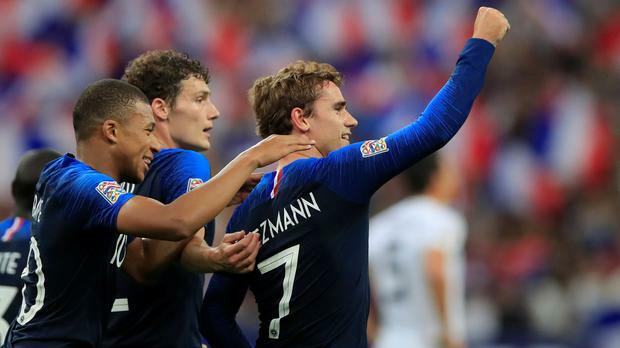 Antoine Griezmann scored twice as France came back from a goal down to beat Germany 2-1 in the UEFA Nations League on Tuesday. Germany manager Joachim Low admitted he was feeling pressure over his job following a 3-0 loss to the Netherlands on Saturday which left them bottom of their Nations League group. An early goal from the penalty spot gave Germany the lead before 10 minutes when Toni Kroos rolled the ball home past Hugo Lloris after a questionable call for handball on France’s Presnel Kimpembe. Germany should have been up two minutes later, but Leroy Sane misplaced a cross to Timo Werner on a lightning-fast counter-attack and Lloris was able to come out and cut off the pass. Mbappe had another great chance go begging just after break when he poked a right-footed shot wide of Manuel Neuer’s goal after getting in behind the German defence. France were back on level terms just after the hour mark when a well-marked Griezmann was able to redirect a perfect Lucas Hernandez cross over Neuer to make it 1-1.